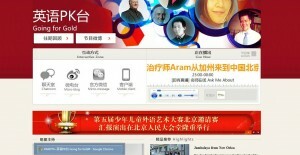 Day 50.5 in Beijing: A One Hour Special on From The Bay To Beijing on AM774.com! Bruce, from Bruce in Beijing, and Jing Jing from AM774.com did a one hour special on From The Bay To Beijing today! It plays best in Internet Explorer. Also scroll down and look at the pictures and some of the transcripts of the show! If you remember, I did a blog post about Bruce on Day 23 in Beijing: Connolly. Bruce Connolly.